I don’t know about you, but fracking was one of the topics I used to learn about year after year in high school. We would watch documentary after documentary and read article after article on the subject and basically I have been programed to recited random facts on the dangers of fracking. For example, did you know that the chemicals used in fracking can seep into wells and contaminate many citizens’ drinking water? Well, I do. 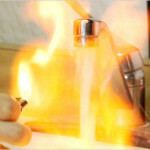 In fact, if you turn on a water tap that was connected to a contaminated well and held a lit match to it, the stream of water could actually catch on fire– yeah, fire. But before I go down a path of bashing fracking, let me start with how the use of natural gas benefits the planet and the people who use it. First of all, natural gas when burned releases less green house gases into the atmosphere when compared to burning fossil fuels. This means that natural gases can help to combat global warming to some degree. Additionally, while fossil fuels are starting to run low and the prices are being driven up as a result, natural gas is a newer resource that has not been exploited as much. Therefore, the prices for natural gas are remaining on the lower side. Which is nice for the consumer. So with these nice benefits of natural gas, why am I suggesting that it is not a good source? 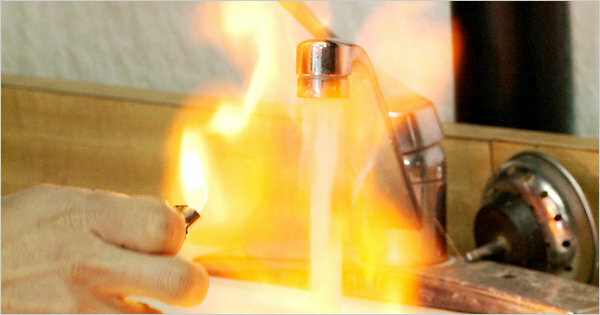 Well aside from the flaming water that people near fracking areas have to deal with, the process of fracking itself is extremely detrimental to the Earth. To collect natural gas, a company basically forces the gas to swell out of the Earth by forcing a concoction of man made chemicals into the ground. These chemicals have not been thoroughly tested either for the effects that they have on the environment or on the people living near the sites. In fact, many of the companies who are utilizing fracking in order to gain profit will pay in order to by pass any environmental testing that the government may ‘require’. Moreover, the sites in which fracking occurs basically tear out any vegetation and destroy any habitats near by. This has even started to become an issue in Pennsylvania counties. In the documentary ‘Gasland’ by Josh Fox, Fox describes how he initiated his journey to discover the truth behind fracking. He noticed how the little river and forest behind his childhood home had started to turn sickly and worried that it was due to the giant machines near by that forced these chemicals into the ground which then seeped into underground water sources. He goes onto explain that this is the reason why people who rely on well water that live near these excavation sites often are forced to buy other sources of water or use elaborate filtration systems. These chemicals simply just make the water unsafe for human and animal consumption. Moreover, there then becomes the issue of the public policy behind contaminating people’s water sources. What happens to the people who are forced to resupply something that they never had to supply in the first place.